You can find kola nut extract as an ingredient in energy drinks or sold separately as an energy supplement or weight-loss aid. According to the “Encyclopedia of Natural Medicine,” kola nut contains high quantities of caffeine, which is why manufacturers market the extract for weight loss and as an energy supplement. Additionally, you can use kola nut extract as a diuretic. Further uses have been as a remedy for headaches, rheumatism, whooping cough and asthma. According to the “Encyclopedia of Natural Medicine,” indigenous people in western and central Africa have used kola nut as a natural remedy for hundreds of years. Slaves brought to the Americas introduced the extract to the New World, where they used it to flavor water. More recently, cola manufacturers have used kola nut extract as a flavoring in cola drinks. In fact, the Coca-Cola Co. uses kola nut extract to give its soft drink a higher caffeine content and its unique flavor. 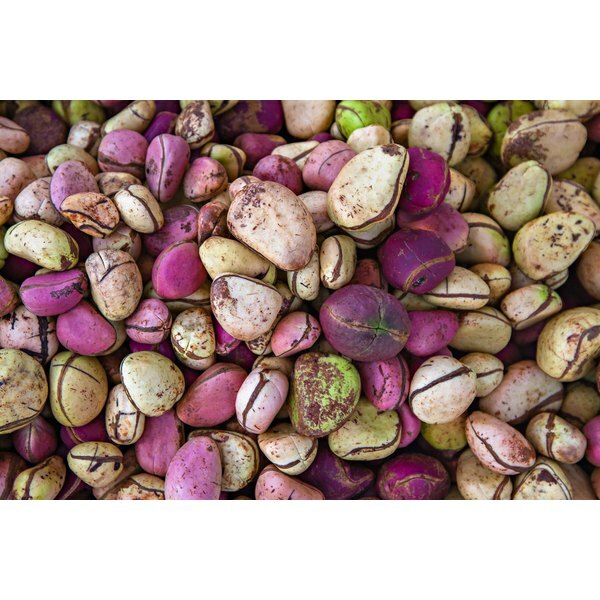 According to a study published in the August 2009 “Food and Chemical Toxicology,” kola nut has similar effects to an equivalent dose of caffeine. Further, this same study concluded that you can safely consume kola nut in quantities up to 0.69 mg per 2.2 pounds of body weight, per day. According to the "Encyclopedia of Herbal Medicine: The Definitive Home Reference Guide to 550 Key Herbs With All Their Uses as Remedies for Common Ailments,” kola nut is a stimulant you can use to effectively suppress hunger and fight fatigue. The book says that kola nut can decrease feelings of intoxication from alcohol, and that kola nut may work as a cerebral vasodilator, improving the blood flow to the head. However, scientific studies do not confirm that use of kola nut is effective. If you have allergies to caffeine or other stimulants, you should not consume kola nut. Women who are pregnant or breast-feeding should also avoid the extract. People who have high blood pressure, anxiety, ulcers, seizures, stroke, heart disease or sleeplessness should talk to their doctor before using kola nut. Should you experience any adverse reaction to kola nut, immediately discontinue use and seek medical attention.